I recently returned from a ministry trip to Vietnam. What a trip! 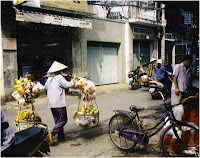 Vietnam is hungry for the life of Jesus. The country is communist and very oppressive toward any vibrant form of Christianity; however, churches are springing up underground all over the country. It’s an awesome thing to see what the Lord is doing! I ministered in a small church one Sunday. We could not gather outside the building because they did not want to attract any attention. But inside that building there were 40 men, women and children praising God, worshiping with uplifted arms, swaying to worship music and exalting the one true God of the universe, Jesus Christ. It was so exciting to walk into a church halfway across the world and experience the same Holy Spirit, read from the same Bible, and prophesy in the same name-- the name of Jesus Christ.